Cures to a hard slip resistant textured finish. Adheres to fibreglass, wood, steel, concrete and other surfaces where a slip resistant finish is desired. Suitable for steps, ramps, bathtubs, boat decks, diving boards, snowboards, skateboards, surfboards and other sport surfaces where increased traction is needed. 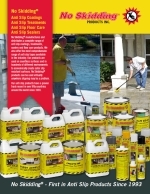 Ideal for coating concrete, wood, and acrylic surfaces. Self priming on most surfaces. Quick drying. For use indoors and outdoors. One 12 oz. aerosol covers up to 24 square feet. 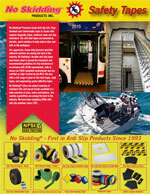 No Skidding® Anti-Slip Acrylic Clear Aerosol Spray, clear or white acrylic aerosol that is durable and non yellowing. Quick drying. For use indoors and outdoors. Easy to use. Suitable for concrete, wood and acrylic surfaces. Slip Resistant. No Skidding® Anti Slip Aerosol Spray Effective on steps, ramps, loading docks, fire escape ladders, stair treads, pool surroundings, boat decks and around machinery. Quick and simple to use. Available in clear, white, black, grey and safety yellow.